Successfully Added Portable Wi-Fi Photo Printer - Prints 2.1 x 3.4 Inch Photos From Smartphone, Free Android and iOS Apps to your Shopping Cart. Snapping photos on your phone is all good and well but they don't replicate the feeling of a physical photos when shared. 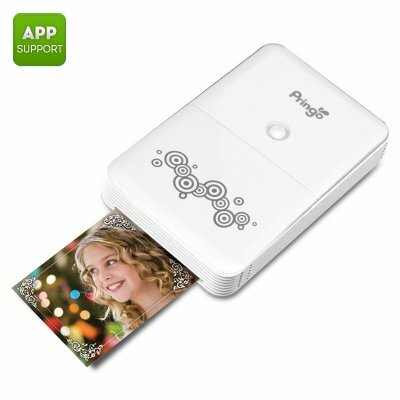 If you long for instant photos to capture memories of a night out, picnics in the park or child's birthday party then this portable photo printer is for you. This fantastic printer is a go to for all those special occasions letting you print out photos directly from your Smartphone. You've probably uploaded your favorite snaps to Facebook and Instergram but physical photos still have a place and there is nothing like watching the face of a loved one light up when presented with a physical picture they can hold and touch. Just like the original Polaroid cameras this photo printer provides p[pictures on the go. It uses dye sublimation technology and offers a 290dpi resolution, printing your images in just one minute. Unlike those old Polaroid cameras of yesteryear you don't have to print every photo you take so can select the best pictures on your phone before sending to this portable printer. Now you can easily add the best shots you take to your photo album, pin them on your refrigerator, put them in a frame or give out wonderful mementoes to family and friends. Using Wi-Fi its quick and effortless to link to iOS or Android Smartphone and tablet PCs without the need for any cables. A 550mAh battery lets you run of 10 prints per charge and its small compact size makes it easy to pack on any day out or trip away. The perfect accessory that turns your cell phone photos into fantastic pictures this mini portable printer is ideal for taking along to music festival. days at the beach, holidays and family gatherings where it will being your shot to life as 2.1x3.4 inch photos. The Portable Wi-Fi Printer For Smartphones comes with a 12 months warranty, brought to you by the leader in electronic devices as well as wholesale cool gadgets and Smartphone accessories..